You wouldn’t know it, but I took these shots in a church: Saint Paul’s basement in Oakland. I was shooting more church-like photos for another project, and caught sight of that checkered-tile floor as I leaned over the bannister of a staircase. I haven’t shot digital for months, so it felt strange to click off a bunch of frames instead of economizing them like I do with instant film. I’ve been more cautious with photography this year; I’m hesitant to take risks. I’ve been more protective of my grief, and talking about my mother’s life, and I wonder if this is affecting my creative life as well. Also, Jeff and I haven’t traveled much lately — a typical impetus for picture projects — but we planned a few road trips for fall which I’m excited about visiting through my lens. 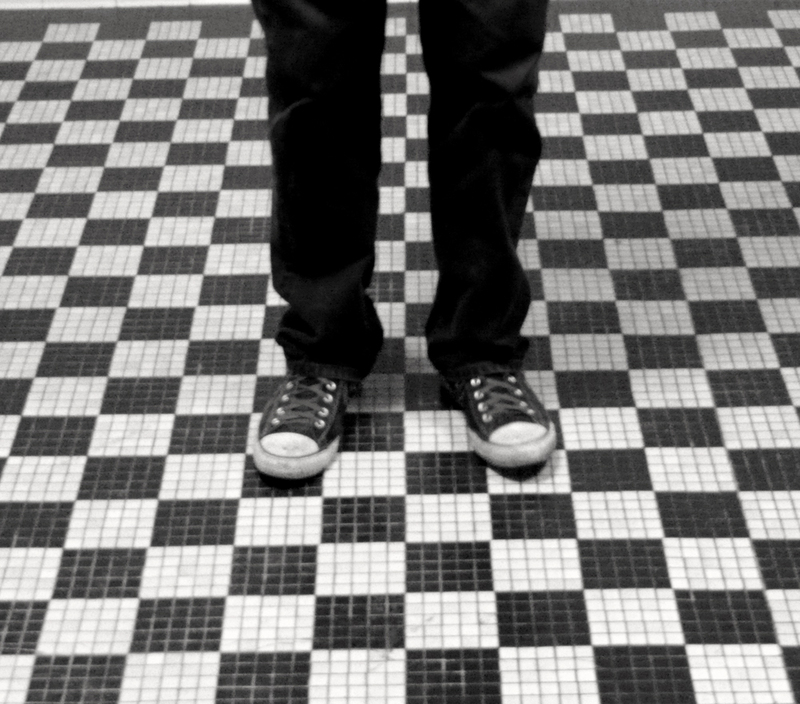 yes, the floor definitely reminded me of the chess board too – i love seeing old tile like that – any sort of geometry in open space. Michael – I never even made that connection (the basement and grief), but it makes a lot of sense to me. Thank you for your insight – I always take someting with me from your comments! I went to high school with Jeff and saw the link to your site when he posted it on Facebook. Just wanted to tell you that I love your photography and writing. You inspire me! Hi Jill (nice to ‘meet’ you) – Thanks so much for writing -that’s so, so nice, it really made my morning! i love this room – when do we move in? we can move in, once we sell all the other houses we own (the funeral parlor, the candy store, the garage, the firehouse). Dude, these are awesome! Seriously! they’re all great, but the one with you on the floor appears as if you’re on the ceiling! thanks, billy! and thanks to the magic of photoshop – i flipped the image upside-down to create that wonky feeling one gets when in a funhouse. Makes mer think of M.C. Escher, or a dream I once had. fantastic. thanks, kimmy – it is super-dreamlike in that tiny basement. The ceilings were low too, making me feel as if i were stuck in a box.